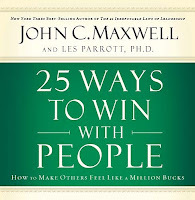 A great way to make deposits in the Emotional Bank Account is by utilizing John Maxwell's 30-Second Rule that he outlines in his outstanding book, "25 Ways to Win With People." In face, this entire book is a great resource in the art of making positive deposits in those that you work with, live with, and care about. 30-Second Rule: within the first thirty seconds of a conversation, say something encouraging to a person. 1. The 30-Second Rule Gives People the Triple-A Treatment. All people feel better and do better when you give the attention, affirmation, and appreciation. "A gossip is one who talks to you about other people. A bore is one who talks to you about himself. And a brilliant conversationalist is one who talks to you about yourself." Psychologist Henry H. Goddard conducted a study on energy levels in children using an instrument he called "ergograph." His findings are fascinating. He discovered that when tired children were given a word of praise or commendation, the ergograph shows an immediate upward surge of energy in the children. When the children were criticised or discouraged, the ergograph shows that their physical energy took a sudden nosedive. Vince Lombardi, the famed Green Bay Packers football coach, was a feared disciplinarian. But he was also a great motivator. 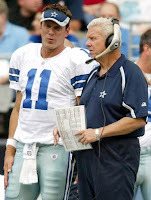 One day he chewed out a player who had missed several blocking assignments. After practice, Lombardi stormed into the locker room and saw that player was sitting at his locker, head down, dejected. Lombardi mussed his hair, patted him on the shoulder, and said, "One of these days, you're going to be the best guard in the NFL." That player was Jerry Kramer...he went on to become a member of the Green Bay Packers' Hall of Fame and a member of the NFL's All-50-Year Team. -Motivation helps people who know what they should do...to do it! -Motivation helps people who know what commitment they should make...to make it! -Motivation helps people who know what habit they should break...to break it! -Motivation helps people who know what path they should take...take it! -Motivation makes it possible to accomplish what you should accomplish. "Those who add to us, draw us to them. Those who subtract, cause us to withdraw." "Coaching is a people business. If you take care of your people, the wins and losses will fall into place. Treat people well. You've got to figure out how to work with each one of them. They might not like you every day, but they must respect you." Gotta love the twitter world! It's hooking me up with some great relationships, information and resources. Exchanged some tweets this morning with Coach Steve Finamore of Jackson Community College in Michigan which lead me to Steve's website. Besides blogging, Coach Finamore has a website that is laid out really well for coaches looking for resources. In a left-hand column you can find an index of coaches with coresponding articles. In the right-hand column is a large list of blogs and websites. This is a great resource site and one that I bookmarked this morning. If you get the chance you need to check it out. One of the most valuable lessons I learned from Stephen Covey's "The 7 Habits of Highly Effective People," is the Principle of the Emotional Bank Account. Covey teaches that in all relationships there is an emotional bank account that we can either make deposits or withdrawals by our words and our actions. Each communication we have with someone is going to lead to one or the other and it is up to us to make sure we are leaving withdrawals. This is a philosophy that has served me well, not just with players but with other coaches, boosters, alumni, media and members of the athletic department. As a coach, I am very demanding on players -- I am not the most patient coach in regard to teaching the game. The ability to build up emotional bank accounts with student-athletes is very important. Even in being demanding, you can make deposits by being positive in your approach. 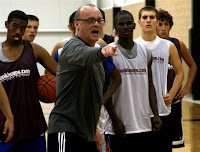 One of the most important things I've learned from Coach Don Meyer is that is not what I say to the player that counts, it is what they heard. And that in itself is a great clue to a coaches approach. On those moments when I am demanding of a player, I want to make sure that the player knows that the fact that I am demanding something of her is compliment to what I think she can do. I must believe in her abilities if I am pushing her to take it to another level. Probably the most important part of this is the follow up conversation. Anytime I have had to really get after a student-athlete in practice, I want to make sure that I have a follow up conversation with her. In the heat of the moment, either a game or a practice, I don't want the player to be confused and what I meant by what I said. "It's not what you say that counts...it's what they heard." I may grab a the player after the game or practice and go over the message again -- in a more calmly fashion. I may write her a note, send her an email or text her to make sure that she understands. I may do it in front of the team after the game or before the next practice. An example: Player A is not working hard in the post for us on the offensive end. She's standing, not posting and sealing and generally clogging up the lane for us. In the heat of the game during a timeout I might be a little harsh with her and tell her she needs to start working harder on the offensive end because it is hurting our offense. I might tell she needs to start getting a better piece of the paint and holding her seal a little longer. And I might finish with, "you've got about two minutes elevate your game or we will need to give someone else a shot." "Wow! You really made a difference in our offense when you went to work down low. Even when you didn't touch the ball your movement occupied the help and got us some great looks for your teammates. I'm not sure you realize how important you are to our success when you play like that or extended periods of time." I might follow that up the next day with specific video clips. What's important is that I just can't criticize the player for her lack of effort or execution. I must tell her why it's important to her and her teammates. I must make sure that I compliment her when she does perform well. And the video is a visual reinforcement -- another form of making a deposit into her emotional bank account. It is also important to know that some players need more deposits than others but note that all players need deposits at some time. I used to think that there were some players that were special, understood and therefore didn't need deposits at all -- untrue. All players need to the positive reinforcement. 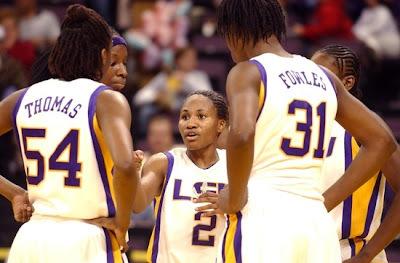 My first year as an assistant coach under Coach Sue Gunter we had only one senior -- Latasha Dorsey. I can't begin to tell you how glad I was that I had the opportunity to coach her and become her friend. She was an outstanding point guard and tremendous leader and guided our young, undersized team to the Sweet 16 that season. 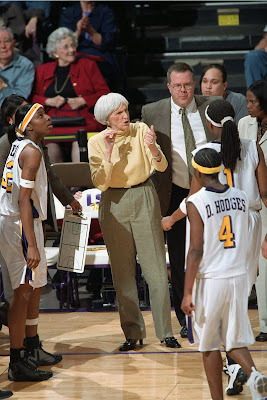 She left LSU and became a very good high school coach. With great pride, I enjoyed watching her teach and coach her teams. Last year she made the jump to the collegiate level and is an assistant at Western Kentucky and doing a great job. She recently started blogging and I am looking forward to her sharing her thoughts on coaching. She will of course update all of us on the progress of her program at WKU but, as you can see, she will also share some teaching points as well. From the book "Knight: My Story," with Bob Hammel, Coach Bob Knight talks about the approach a coach should have with his/her team going into games. At LSU, we've always referred to this as "middle of the road" coaching. Keeping our team on an even keel. We don't want them "to up" for so-called big games, or "not up" for games that the ordinary fan doesn't deem as a big game. It is absolutely not about the score or the outcome. This is one of the things we've learned from Coach Knight and later emphasized from Coach Nick Saban. It's not the result -- it's the process. When you get your team worried about the process...the fundamental execution of each possession --then the results will take care of themselves. 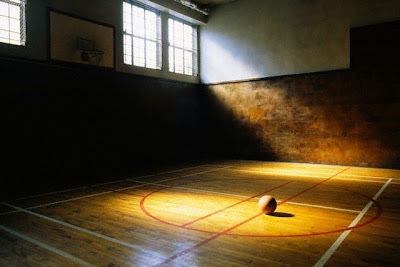 Kids have to understand that you -- you, the coach -- arent' going to be satisfied with just winning. Play can be sloppy, things can be poorly executed in games you win, but before you can be good and beat better teams, that kind of play has to be straightened out and eliminated. Kids will be satisfied with what you tolerate. If a coach tolerates mistakes, kids will be satisfied with mistakes. There have been times I was more upset after we won than when we lost. 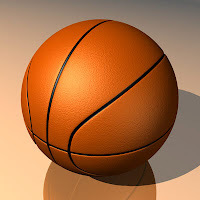 The most essential thing in a team's being ready for a game is that the coach is ready -- that the coach understands the importance of keeping everything on an even keel. Kids react in very, very funny ways to things that are said. From just the inflection in the coach's voice, they can pick up, "This game isn't very important," or "This game is important." If you're a pretty good team, you're going to play some teams that aren't nearly as good as you are. When that happened, I tried to be honest. I'd tell my players: "Hey, unless you guys just decide to go out and do nothing, there's no way we should lose this game. This is a game that's going to be determined by your attitude." You can't make every game out like it's the national championship game. But over the course of a season you've got to develop a sense of pride in performance. Winning isn't just enough. Winning is the last of all criteria that I think you should use to determine how well you're playing. When the way you've won a game just isn't good enough, you show your players why: you talk about turnovers, missed blockouts, fast-break points allowed, fouls committed -- to show your team, "We just didn't play well." You're trying to get players to understand that how they play is a hell of a lot more important than whether or not they win. Some more notes on Tiger Woods from the book "Tiger Traits" by Nate Booth. Any time you make a change -- whether it's improving your golf swing, moving your family from one city to another or leading a new initiative in your company -- you will go through three staged of change. To maximize your chances of success, it's vital that you understand and enthusiastically and intelligently move through the stages. As strange as it might seem, the first stage of all changes is an ending. When Tiger made the changes to his swing in 1997 and 2002, he had to leave his old swing behind. For most people this would be a difficult choice, because Tiger had been wildly successful with that swing. However, he knew the swing that got him to where he was would get him to where he wanted to go. So he made a leap of faith. "Don't discover new lands without consenting to lose sight of the short for a very long time." Stage two is the limbo period between the old and the new. "It's not so much that we're afraid to change or so in love with the old ways, but it's that place in between that we fear. It's like being between two trapezes. It's Linus with his blanket in the dryer. There is nothing to hold on to." It's the price you have to pay to make the change. If done correctly, the price paid in the transition period is far less than the price paid if you stubbornly hang onto the first bar. The first stage of change is an ending. The last stage of change is a new beginning, complete with enhanced skills learned during the flight. As May prepares to run into June, I am excited about first trip to the state of South Dakota. 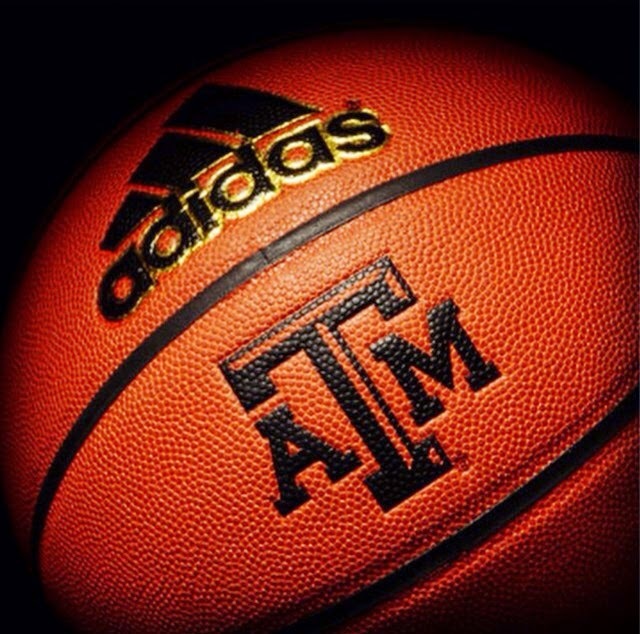 I will be attending Coach Don Meyer's annual Coaching Academy. It will be the 19th such academy for Coach Meyer and his staff and it will be my 8th. I have attended seven previously while Coach was at Lipscomb in Nashville. It will also be my first opportunity to hear Jerry Krause speak in person as he is the Academy's guest speaker this year. I have said it before and I will continue to say it, nothing has been better for my improvement in the coaching profession than Coach Meyer. Between his DVD's, books, clinics and the Academy, I have been able to improve at my craft, and, most importantly, improve my team and program. The Academy is an exciting time of the year because I know I'm going to learn something that I can bring back and add to our program at LSU. I know I will discover some things to help us improve what we are already doing at LSU. I will get to spend some time with some coaches who genuinely care about the game. And I will get to spend some time with Coach Meyer who has been a mentor and friend of mine for many years. If you every been to a Coach Meyer Academy than you already know what I'm talking about. If you haven't, it is a must for your coaching career. Don't think, "I've heard Coach Meyer at a clinic, so the Academy is probably similar." It is not. His team is there to go through everything he talks about. There is not an area of basketball that is not discussed in detail. And Coach always takes the time to talk to us about areas outside of coaching that make us better people as well. Great news from the WBCA! 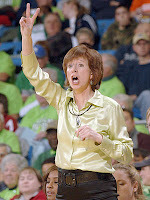 We've landed a great leader to guide the Kay Yow/WBCA Cancer Fund. ATLANTA -The Kay Yow/WBCA Cancer Fund®, in partnership with The V Foundation for Cancer Research, announces Marsha Sharp, avid women’s basketball pioneer, as the first executive director of the Fund. Sharp, most known for her 24-year tenure at the helm of the Texas Tech women’s basketball program, created a dynasty throughout West Texas and the entire country. She led her teams to remarkable success during her time with the Lady Raiders, including the 1993 National Championship. 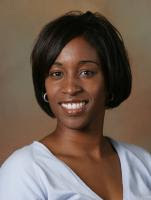 Sharp has been recognized for her accomplishments by being inducted into the Texas Women’s Hall of Fame in 1999, the Texas Sports Hall of Fame in 2000, the Women’s Basketball Hall of Fame in 2003, and the Texas Panhandle Sports Hall of Fame in 2008. She was named the Russell Athletic/WBCA National Coach of the Year in 1994 and SWC/Big 12 Coach of the Year seven times. 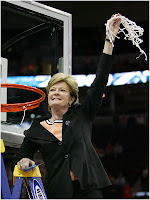 She served on the Women’s Basketball Coaches Association (WBCA) Board of Directors and was its president from 2001-03. Retirement from the coaching arena has only left more time and energy to expand Sharp’s career and pursue her other passions, both locally and nationally. She has served on the Women’s Protective Services board and co-sponsored the Alzheimer’s Association Memory Gala. She currently is president of the YWCA board of directors, serves on the Carillon Senior LifeCare Community board of directors, and the LISD School for Young Women Leaders advisory council. She has also been a TV color analyst for the San Antonio Silver Stars of the WNBA and director of a groundbreaking camp called Hoops and Leaders for elementary age boys and girls. Sharp also founded the United Future Leaders Program through Texas Tech University which promotes civility, ethics, leadership, and service qualities among West Texas youth. 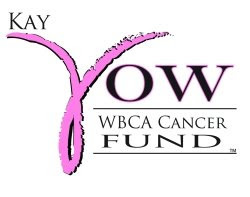 The Kay Yow/WBCA Cancer Fund is a 501 c(3) charitable organization committed to being a part of finding an answer in the fight against women’s cancers through raising money for scientific research, assisting the underserved and unifying people for a common cause. Donations can be made at www.JimmyV.org or by calling 1-800-4JimmyV. All donations are tax deductible. For more information, visit www.wbca.org/kayyowwbcacancerfund.asp. The V Foundation is a charitable organization dedicated to saving lives by helping to find a cure for cancer. The Foundation seeks to make a difference by generating broad-based support for cancer research and by creating an urgent awareness among all Americans of the importance of the war against cancer. The V Foundation performs these dual roles through advocacy, education, fundraising and philanthropy. Founded in 1981, the WBCA promotes women’s basketball by unifying coaches at all levels to develop a reputable identity for the sport and to foster and promote the development of the game as a sport for women and girls. 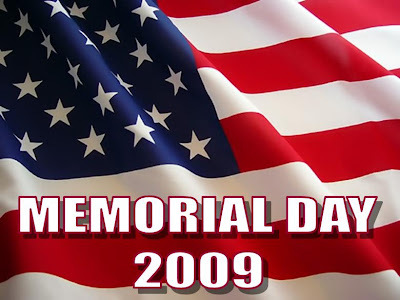 For additional information about the WBCA, please visit wbca.org. my blog and won't be the last...worth repeating. Our next webinar is scheduled for Wednesday May 27 at 9:00 pm EST. Our topic will be a 10 point professional growth plan for basketball coaches. The panel will be the coaches who are putting together the Coaches Academy--Ed Schilling, April (McDivitt) Foster, Josh Stinson, and myself. In addition to the topic for the evening, you are welcome to submit any questions about our upcoming Coaches Academy. Hope many of you will be able to join us. Here is the link to download the second part of our webinar with Coach Hurley. The insights were fantastic. It is about 45 minutes long, so make sure to find some time where you can listen with a pen and paper to take notes! In 2008, Pat Williams, the GM of the Orlando Magic and a tremendous motivational speaker put out a book, "The Ultimate Coaches' Clinic." It is a fascinating book because of the style Pat utilized. He surveyed over 1000 coaches and administrators for insights to what is important to successfully do their job. From time to time I will share a few but it is a great book to own and I highly recommend it. 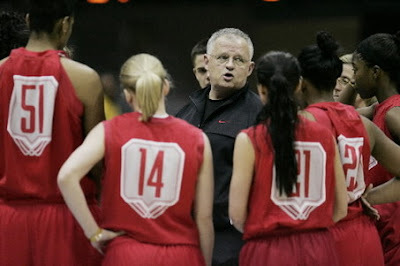 Today, a few thoughts from a coach that I greatly respect, Ohio State's Jim Foster. 1. Never stop trying to get more information. Always pick the brains of successful people in your business. You can never know enough. 2. Your relationships with the people you work with is important. Get to know them and what makes them tick. 3. Don't be a good listener -- be a great listener. It's vital. 4. Determine your philosophy, but continue to adjust it as time moves along. Be flexible, because you must adapt to change. 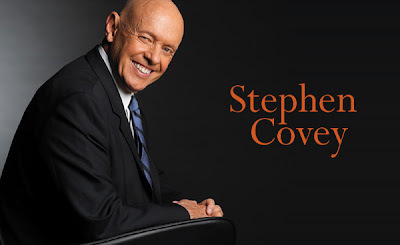 Stephen Covey shares some thoughts on vision from his book "The 8th Habit: From Effectiveness to Greatness." Vision is seeing a future state with the mind's eye. Vision is applied imagination. All things are created twice: first, a mental creation; second, a physical one. "Most people live in a very restricted circle of their potential being. We all have reservoirs of energy and genius to draw upon of which do not dream." Seeing people through the lens of their potential andt heir best actions, rather than through the lens of their current behavior or weaknesses generates positive energy and reaches out and embraces others. There is great power in viewing people separately from their behavior, for as we do, we affirm their fundamental, unconditional worth. Cultivating the habit of affirming people, of frequently and sincerely communicating your belief in them -- particularly teenagers who are going through their second identity crisis -- is supremely important. "Thee lift me and I'll lift thee and we'll ascend together." Below is an article on the five leadership traits from Mark Snead at Leadership 501. Some people sit and pontificate about whether leaders are made or born. The true leader ignores such arguments and instead concentrates on how to become better at leading people. In this article, we are going to discuss five leadership traits that people look for in a leader. If you are able to increase your skill in these five traits, you will make it easier for people to want to follow you. The less time you have to spend on getting people to follow you, the more time you have to spend refining exactly where you want to go and how to get there. These five characteristics come from Kouzes and Posner’s research into leadership that was done for the book The Leadership Challenge. Your skill at exhibiting these five traits is strongly correlated with people’s desire to follow your lead. Exhibiting these traits will inspire confidence in your leadership. Not exhibiting these traits or exhibiting the opposite of these traits will decrease your leadership influence with those around you. It is important to exhibit these traits. Simply possessing each trait is not enough; you have to display it in a way that people notice. People want to see you demonstrating these traits–not just assuming that you have them. It isn’t enough to just be neutral. For example, just because you are not dishonest will not cause people to recognize that you are honest. Just avoiding displays of incompetence won’t inspire the same confidence as truly displaying competence. The focus of each of these five traits needs to be on what people see you do–not just the things they don’t see you do. Being honest isn’t a matter of not lying–it is taking the extra effort to display honesty. "We are all something, but none of us are everything." "Perhaps the most important thing we can undertake toward the reduction of fear is to make it easier for people to accept themselves, to like themselves." if we do not give it to them." "To safeguard democracy the people must have a keen sense of independence, self-respect, and their oneness." "You cannot have a successful team if players don't respect each other and the coaches." "Respect is earned, but there should also be a certain level of respect for every human being whether or not you know him or her." "You also have to respect your opponents." "I respect my players as people. I have had player that I've had trouble respecting -- as players. The quickest way for someone to lose my respect as a player is for that player to put out minimal effort." "It's also difficult for me to respect anyone who tries to undermine the team, and, unfortunately, it only takes one player with a bad attitude to destroy team chemistry." Coach Musselman found an article with Nick Saban talking on the importance of leadership in the off-season -- when coaches aren't around. It is a valuable lesson that I learned from coaching Temeka Johnson, now with the Phoenix Mercury. Make no mistake, Meek was a great leader for us during practice and games and an extension of the coaching staff -- but it was the leadership she gave us the other 21 hours during the day -- or during the off-season when we couldn't be around. Her senior year, she took the team's four freshman out to dinner the night before our first official practice and told them what to expect from practice. She told them about each coach, her teammates, the structure of our practices and what they needed to do to succeed. She made sure that maximum effort was given in the weight room and during pick up games in the summer. She constantly spoke to the younger players of "the Lady Tiger Way," of handling everything from basketball, to academics, to conducting themselves in the proper way. She was a guiding force for all of our players during her career -- on and off the court and what she did in terms of leading our team when the coaches weren't around was a major ignition in a run that lead to five consecutive Final Fours. Today, Temeka continues to "lead" by having her own foundation, the HOPE Foundation in which she gives back to the community. You can learn more at: http://www.meekshope.org/. You can also follow Meek via Twitter at: http://twitter.com/Quickdeuce. "We had a good spring, but I don't think the true team chemistry really surfaces until the summertime. The coaches are always with the guys in spring practice. In the summer, the coaches aren't there as much. That's when the true leadership starts to emerge. You start to see the core buy-in that everybody has in terms of how they go about what they do. They have to work with the strength and conditioning coaches. For the first time, the responsibility becomes theirs instead of somebody making them do it. That's where the true chemistry (develops); you see what the team might be." Coach Musselman is always working to find articles for us that help us as coaches and like Kobe -- he has great range -- find this article in a Korean newspaper. 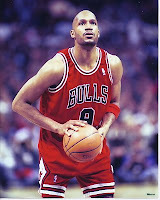 It is a great article to share with your players because it talks about how Ron Harper became a championship player by understanding, learning, and accepting his role. Through the first eight seasons of his career, Harper was a good player on two bad teams with the Cavs and later the Los Angeles Clippers. Ron Harper eventually decided he wanted to play for a winner, even if it meant a reduced role. Harper joined the Bulls just as Michael Jordan returned to the court after a brief retirement. When he arrived, Chicago coach Phil Jackson asked Harper to focus on defense. Harper explained that he had matured as a player, and his goals had changed. As a player on teams with prolific scorers like Shaquille O'Neal and Michael Jordan, Harper didn't get the chance to take a lot of shots. Harper remembered his first meeting with Jackson. Phil asked me, "how am I going to help this team" and I said "my job is to be a defensive player." and he said "you're going to play a lot then," Harper said. "I knew what he wanted me to do, and I did it." One of my dear friends in coaching is Greg Brown. I first got to know Greg many years ago when he as on the staff of Don Meyer. Later I got to coach against Greg while he served on Pat Summit's staff at Tennessee. Now he is at Central Florida where he helped guide them to the NCAA Tournament last year. He recently started a blog and wanted to let everyone know to bookmark it because Greg has a wealth of knowledge to share with us all -- I guarantee that I'll be checking in daily. You can only imagine what working with Coach Meyer and Coach Summit can do for improving you basketball IQ! I love the newsletters I get from Brian Tracy -- I come away with something from each one that can make me a better coach and a better person as well as something that can help my team. I know I've said it before -- and I'll keep saying it -- head to www.briantracy.com and sign up for the newsletter, the quote of the day and check out everything else he has to offer. I have a great collection of books from him that I constantly look at over and over. It is not what happens to you that counts. It is how you react to what happens to you, especially when you have unexpected problems of any kind.In this newsletter, you learn powerful strategies you can use to keep yourself thinking and acting positively and creatively.Here are four things you can do to assure that your attitude is the very best it can be, under all circumstances. Second, whenever you're faced with a difficulty, focus on the solution rather than on the problem. Think and talk about the ideal solution to the obstacle or setback, rather than wasting time rehashing and reflecting on the problem. Solutions are inherently positive, whereas problems are inherently negative. The instant that you begin thinking in terms of solutions, you become a positive and constructive human being. Third, assume that something good is hidden within each difficulty or challenge. Dr. Norman Vincent Peale, a major proponent of positive thinking, once said, "Whenever God wants to give us a gift, he wraps it up in a problem." The bigger the gift you have coming, the bigger the problem you will receive. But the wonderful thing is that if you look for the gift, you will always find it. The following comes the book "Uncommon." written by Tony Dungy with Nathan Whitaker. It is an outstanding book on the core beliefs that have made Coach Duny who is not only as a coach but as a person and, in effect, has formed the football teams that he coached. Today we look at some of Coach Dungy's thoughts on CHARACTER. How important is character to Coach Dungy? It was the first chapter in his book! For the Colts, character is a quality that can be measured just like height, weight, and speed. In fact, we put more emphasis on this area than we do in physical tools. Coaching ability or talent cannot make up for a lack of character. In the draft, there are only a few things that will knock a player out of consideration for our team, and this issue of character is one of them. We have a category on our evaluation form that is labeled "DNDC" - Do Not Draft Because of Character. What you do is not as important as how yo do it. People who bend the rules to get ahead usually get caught in the long run. But even if they don't get caught, they will always know how they made it to the top. And at some deep-down level, they'll know that they're frauds and that maybe they didn't have what it took to accomplish such achievements on a level playing field. My closes friends are people of high character -- and I don't hang around with people I can't trust. Character begins with the little things in life. I must show that I can be trusted with each and every thing, no matter how trivial it may seem. "Character may be manifested in the great moments, but it is made in the small ones," wrote Phillips Brooks, an American clergyman in the 1800's. Character is tested, revealed, and further developed by decisions we make in the most challenging times. Albert Camus once said, "Integrity has no need of rules." From the magazine, "Get Motivated," comes an excellent article titled, How to Rebound From Setbacks: Ruben Gonzales, the three-time Olympian tells how he excelled in one of the Olympics’ most perilous sports --the lug. Principle 1- Go All the Way: When you decide that quitting is not an option, you will soon be in the top 10 percent of your field. Odds are, ninety percent of your competition will simply give up! Principle 2- Create a “Dream Team”: Ninety percent of success is determined by whom you associate with. So create a Dream Team of people around you who will encourage you through the toughest times. Principle 3- Give Yourself a Pep Talk: It’s easy to get down when things aren’t going your way. 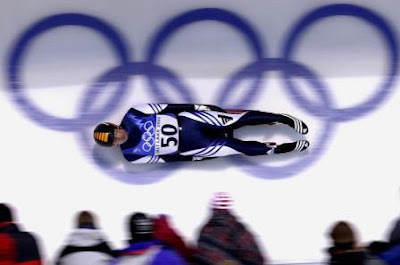 After a bad luge run, sometimes I walk up and down the track for 20 minutes, saying: “I can do it! I will make it, because there’s always a way!” When you get down, pick yourself up and give yourself a pep talk. Principle 4- Learn from Your Mistakes: High achievers believe that they will either do well at each task they tackle or they will learn something to help them win in future. As funny as it sounds, most successful people “fail their way upwards.” I was no different, crashing all the way to the top! Principle 5-Recover Quickly: When winners make mistakes, they don’t waste time whining. They do whatever it takes to recover quickly, so they don’t lose their momentum. When a boxer gets knocked down, he has only 10 seconds to get back up. If he gets up in eleven seconds, he loses the fight. SO the next time you get knocked down, decide to act like a winner. Get up, take immediate action and make your dream a reality! KEY COMPONENT TO MAKING DREAMS COME TRUE: DO SOMETHING! The process starts by doing something-- doing anything if you are a naturally sedentary person or someone who is discouraged. Declaration of Independence signer John Hancock asserted, "All worthwhile people have good thoughts, good ideas and good intentions, but precious few of them every translate those into action. 2.Do something today that relates to your dream. Runner, author, and cardiologist George Sheehan observed, "There are those of us who are always about to live. We are waiting until things change, until there is more time, until we are less tired, until we get a promotion, until we settle down -- until, until, until. It always seems as if there is some major event that must occur in our lives before we begin living." If you want to achieve your dreams, you cannot allow yourself to be one those people. 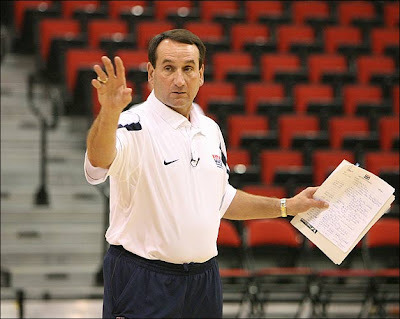 From his book "The Gold Standard," Coach Mike Krzyzewski talks about the two-way street for coach/team adaptability. "You cannot simply ask your team to just adapt to you. As a leader, it is part of your responsibility to adapt as well. If everyone simply adjusts to the style of the leader, you are not getting the most of what everyone has to offer. 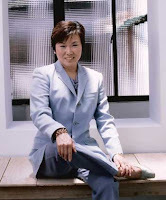 Instead, a leader needs to be a part of a mutual adaption that forms a combination of the best of everyone." "When leaders make clear their willingness to change, it establishes an environment in which everyone can be comfortable adapting." Two things must happen before I can demand responsible behavior from the team at large. #1 I've got to demonstrate to them that I fulfill my own responsibilities. That means that I, too, am accountable. For instance, I'm not the most punctual human being. But the one thing I am never, every late to is a team meeting or a practice. #2 I must make sure that the responsibilities of our players and staff are clearly delineated and that everyone understands them. That way, when there is a breakdown, we know what happened. If you do not clearly articulate who is responsible for what, nothing will get done. We've all been in situations where the simplest task has done unperformed, Why? Because even thought Anybody could do it, Everybody thought Somebody Else would do it, and Nobody did it. Organization is half the battle, Start with yourself, and your own desk. Becoming principle-centered is just that: becoming. It's not arriving; it's a lifetime quest. But the more people align their lives with true north, the more they begin to develop certain characteristics common to principle-centered people. 1. They're more flexible and spontaneous. They are not chained to plans and schedule. 2. They have richer, more rewarding relationships with other people. They put people ahead of schedules. 3. They're more synergistic. Instead of doing "their thing" to others, they find far greater rewards in working with others to achieve shared vision. 4. They're continually learning. Because they know there's a true north, they're constantly seeking to discover, understand and align their lives with it. 5. They become more contribution-focused. They channel their time and energy toward contributing more than consuming, toward giving rather than getting. 6. They produce extraordinary results. They grow in their ability to work with others and facilitiate high-quality interdependent production. 7. They develop a healthy psychological immune system. They can handle problems. 8. They create their own limits. They don't work until they drop from exhaustion, spend until there's no credit left, or keep going on projects until they run out of time. 9. They lead more balanced lives. They're active physically, socially, mentally and spiritually. 10. They become more confident and secure. Their security doesn't come for work, associations, recognition, possessions, status, or any other extrinsic factor. 11. They're better able to walk their talk. There's no conscious duplicity, double-mindedness, or hypocrisy. 12. They focus on their Circle of Influence. The don't wast time or energy in their Circle of Concern. 13. They cultivate a rich inner life. They draw strength from regular spiritual renewal. 14. They radiate positive energy. They become more cheerful, pleasant, optimistic, positive, upbeat. 15. They enjoy life more. They don't condemn themselves for every foolish mistake or social blunder. AME: You said you tell your team what it should look like. 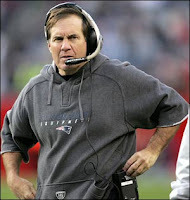 Do you spell it out and tell the team: "I want us to make it to the Super Bowl"? Or do you start with small goals? PARCELLS: What I say to them is, "I want this team to play consistently to its potential." My challenge as a coach is to organize it, structure it, give the team a good enough design and the motivation to allow the team to play to its potential, as I perceive the potential to be. I'm not out there trying to please the media or what other people's perception of their potential is. I have my own idea about what that potential is, and that's the one that I'm using as the standard. In other words, I want them to play to their potential as I perceive it to be, because I think I'm a better evaluator of that potential than the layman or the media or the people outside the organization. I basically determine where we can go, and I want them to make every effort to reach their potential. And if they do, then I deem them to be successful in that year. And if they don't, regardless of what the record says, I deem them to be unsuccessful. I've had teams with winning records that I thought were unsuccessful, and I've had teams with losing records that I thought were pretty successful in terms of fulfilling their potential. AME: What other motivational techniques have you used? PARCELLS: First, I think motivation has to be self-starting. I don't have the ability to motivate anybody that doesn't want to do it. I think people sometimes confuse motivation with proper direction. If I'm pretty sure the player wants to do it, then I've got to guide him properly toward where he wants to go. If that's called motivation, well, it's motivation, but I don't look at it quite like that. I think that sometimes people confuse proper direction with motivation. There have been other cases where you just have to call someone in and say, "This isn't any good. I'm not happy with it, you're not happy with it, the organization isn't happy with it. Where do you want to go from here? Do you want to go forward and upward and try to accomplish something, or do you want to just try to maintain what you're doing, because that's not going to be good enough around here for very long." That's a form of confrontation. You're not belittling the person, but you're telling him that what he's doing isn't good enough. You have to draw a fine line between people that just don't care and those that just need direction. Some of them won't be able to express to you which one of those things is bothering them. You're going to have to determine that yourself by watching them. If a guy is overweight, lazy and in poor condition, then I pretty much can determine that this guy doesn't really care that much about being good at what he's doing. On the other hand, if he's in tremendous condition and is a good practice player and is working very hard to get better, then I've got to think, "Well, I need to technically direct this guy better because he obviously wants to do it." "I don't ever remember wanting to be anything but a coach." "I was always interested in the Xs and Os, especially in football. I remember drawing up my first play, and my dad showing me why it wasn't good. It was a double wing play but I forgot to block somebody." "Some of the most successful coaches aren't ever over .500. It's what you do with what you've got that counts. The ideal situation for a judging us all as coaches would be to eliminate recruiting. Have everybody get a team from their student body. Coaches remain constant. Players change." "The coach gets too much attention, too much credit and too much blame." "Overcoaching is the worst thing you can do to a player. I think every coach knows that." "I've never been a patient man. I demand more of my players at this stage of the game than they're capable of giving." "I don't think coaches are in it for the money. I know I never was, and I didn't make much when I started. For me, it is the personal relationships. That's what I enjoy most, getting involved with your players." there are no little things." 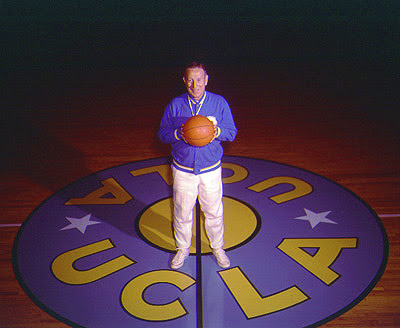 I am in a John Wooden mood this weekend. Spending my free-time rereading "Practical Modern Basketball." Written in 1966, it remains one of the best basketball books I've ever read -- Coach Wooden's principles have stood the test of time! "True success can be attained only through self-satisfaction in knowing that you did everything within the limits of your ability to become the very best that you are capable of becoming. Therefore, in the final analysis only the individual himself can correctly determine his success. You may be able to fool others, but you can never truly deceive yourself, except, perhaps, for a short time." "You must have patience and realize that all worthwhile objectives take time...In the search for success you will constantly find yourself beset with adversity and you must have faith if you expect to reach your goal." "When you're the head coach, you're the head coach 24 hours a day, seven days a week. No matter what happens, it's on your watch, and to a degree, it's your problem." There is no area of basketball in which I am a genius. None. Tactically and strategically I'm just average, and this is not offering false modesty. We won national championships while I was coaching at UCLA because I was above average in analyzing players, getting them to fill roles as part of a team, paying attention to fundamentals and details, and working well with others, both those under my supervision and those whose supervision I was under. Additionally, I enjoyed very hard work. There is nothing fancy about these qualities. They have wide application and equal effectiveness in any team endeavor anywhere. If there is any mystery as to why UCLA won ten national championships while I was the coach, that may clear it up. Here are a few quotes on attitude from my favorite author, John Maxwell. "You are only an attitude away from success!" "Your attitude determines your action. Your action determines your accomplishment." "God chooses what we go through; we choose how we go through it." "Life is not a dress rehearsal." "The greatest mistake a person can make is doing nothing." "Others can stop you temporarily, but you're the only one who can do it permanently." "Where there is not hope in the future, there is no power in the present." "The attitude of the individual determines the attitude of the group." "Your attitude is the outward expression of an inward feeling." "Every change in human attitude must come through internal understanding and acceptance. Man is the only known creature who can reshape and remold himself by altering his attitude." "The higher you go in any organization of value, the better the attitude you'll find." "Circumstances to not make you what you are...they reveal what you are." Don’t line up in the same place two possessions in a row. Bad defenders get screened in front and back; good defenders get screened in the side. 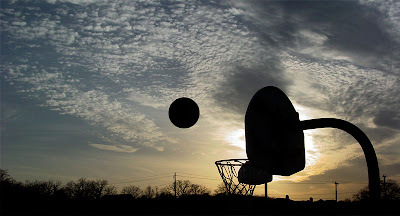 Screen away, the ball must see you before you screen. Spacing on offense is very important. It’s very important to create space by teaching your players to read and react. To often kids don’t want to give up offensive position where they ‘might’ receive the ball. They need to sacrifice and move to create space for a teammate. Demand that they read what’s happening. Scorers must be located in different positions to put pressure on opponents. Coach Pete Newell talking about Coach Bob Knight explaining his motion offense to him the first time -- the lesson however, is it's not for everyone. Too many times, coaches think they can attend a clinic, read a book or watch a DVD and they are ready to put in a system of play. Coach Knight would refer to his offense as "complex simplicity." It was a system based on read and working towards players strengths while avoid their weaknesses. That sounds simple and in effect it is -- but teaching those concepts is complex and time consuming. As Coach Meyer often asks, "Would you rather have better plays or better players." The answer, I think is simple -- but the journey, the process, is not. She who knows when to fight and when not to fight, wins. She who knows when to use many or few troops, wins. She who obtains the wholehearted support of her troops, wins. She who is well prepared to seize favorable opportunities, wins. She who can free herself from interference from superiors, wins. 1. Ancient warriors first place themselves in an invincible position, then wait for the opportunity to defeat their enemies. 2. Master Sun is really saying that you need to know that every part of your battle plan—all strategies, tactics, and contingencies—are in place and certain to work well before the battle begins. Born in the midst of a civil war that lasted 550 years, Sun Tzu knew the only sure thing about a way, once it’s begun, is that there are no sure things. 3. The reason you need that ability is simple: No matter how hard you work, no matter how much you prepare, you will encounter things that you didn’t plan for once the fighting begins. You will have to adapt. 4. Victory Appears in Your Mind First: Victorious soldiers win first, then seek battle; vanquished soldiers fight first, then seek victory. 5. A winner experiences winning in her body, mind and soul before she even goes to fight the battle. 6. How do you achieve a winning attitude? Simply wanting to win, obviously, does not make you a winner, but it is the necessary first step. We all think we want to win, yet many love the joy of struggle far more than the joy of winning.